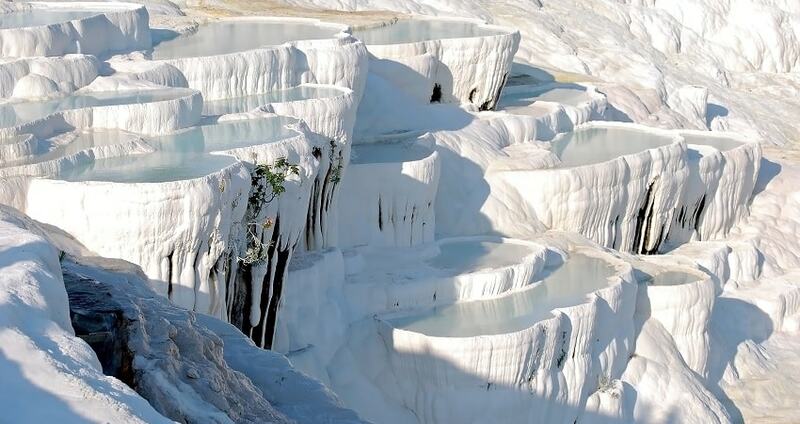 Pamukkale lies in the Turkish province of Denizli and is about 350 km from Alanya. Pamukkale is famous for being one of the oldest and most important thermal cities in the world. The area is most famous for the soft, white, travertines that make the landscape almost lunar. It is in these travertines that visitors enjoy bathing and rejuvenating their bodies. 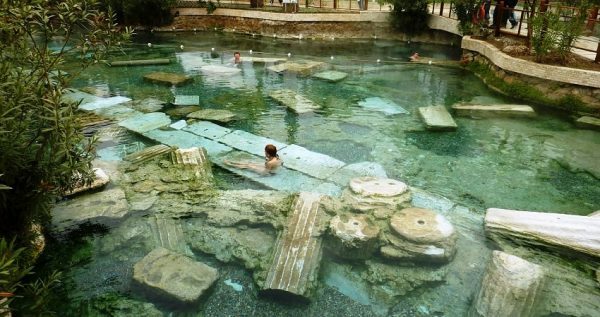 The phenomenal healing powers of the local thermal springs are known the world over, making this a must do trip for those looking to enjoy a unique mind and body experience that you can find nowhere else. 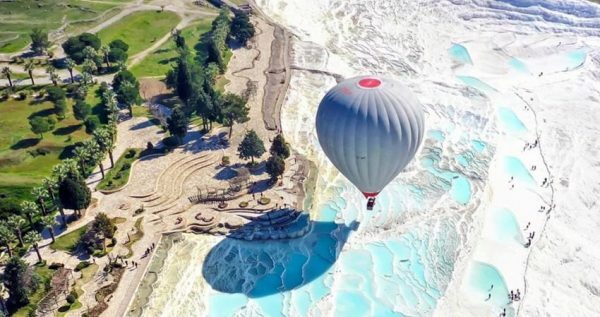 The word Pamukkale actually translates to cotton castle. Once you take your first look at this wonderous place you will instantly realise how it got its name. The stunning, white travertines that jut out over the valley make the area almost look like a floating cloud above the hills. As well as being an incredible place to enjoy the healing powers of the natural thermals the area is so picturesque that you will be spell bound the moment you arrive. Our two-day adventure begins with an early start from your Alanya hotel. We’ll collect you and begin our journey in our comfortable, fully air-conditioned coach. Along the way we’ll take a quick break at Korkuteli to get some breakfast. Although this is not included in the total cost of the tour you are welcome to bring along a breakfast box from your hotel. Following breakfast, we’ll get back on the road and continue our journey. We’ll take a few stops along the way for toilets and refreshments before arriving at Denizli. At Denizli we’ll take in the beautiful surrounding scenery. You will not want to leave your camera at home for this tour. We will enjoy a local buffet lunch from a restaurant which has an amazing view across the valley to the white travertines. This will be your first view of this unique landscape and will get you and the group excited to explore more. Following lunch (not included in the price) we will journey closer to the thermals. 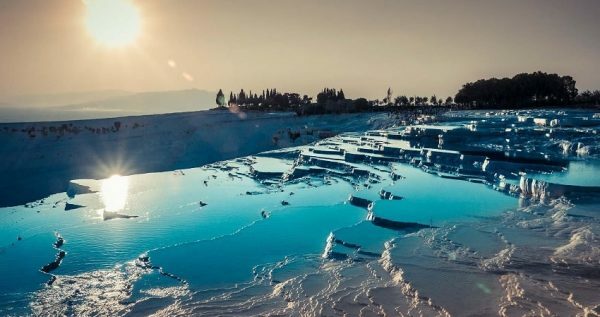 As we arrive in Pamukkale the first experience we will enjoy is the explorations of the ruins of Hierapolis. Here we can discover an amphitheatre, city walls, necropolis and ancient bathhouses. Our guide will be on hand to explain different sites and to tell you the history of each area so please ask as many questions as you like along the way. We will then make our first visit to the famous, white travertines. The hot thermal waters are a wonderful way to relax. They have been known to have amazing healing powers, aiding coughs and sneezes as well as healing the body of daily aches and pains. You’ll notice that it’s not only tourists enjoying this experience but also many locals come here to ease their bodies and to relax and enjoy the amazing views. We’ll take our time here to try different pools and to fully immerse ourselves into the relaxation and powerful healing process. 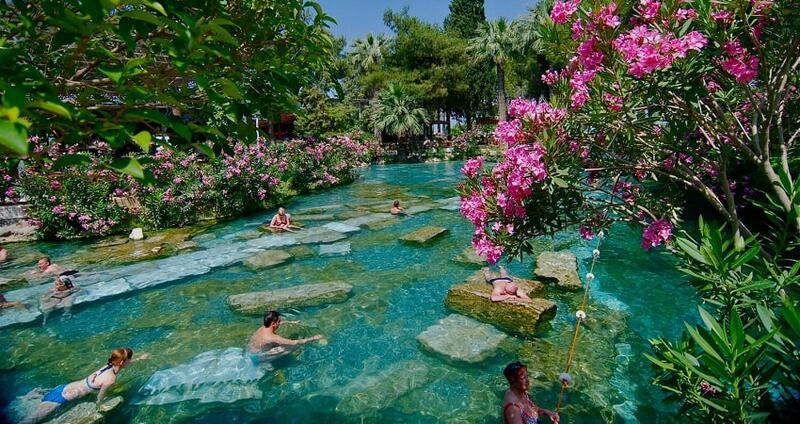 The ancient Cleopatra’s pool is nearby and for a small extra fee you can also bathe in these waters. Following our action packed first day we will drive to a local, comfortable hotel where we’ll check in and enjoy dinner which is included in the price of the package. Get a good nights rest tonight as tomorrow we will have an early start to get as much activities in as we can. Before we check out of the hotel on the morning of day 2 we have a full open buffet breakfast included in the price. It’s important to stock up on your calories as we have a full on day today. Once we leave the hotel we’ll journey to the nearby town of Karahayit. 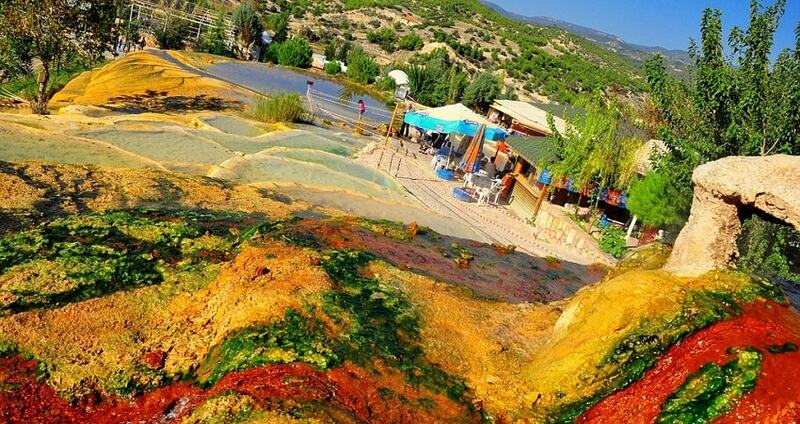 Karahayit is also a thermal town and we’ll get the chance to continue our health infused thermal bathing here. 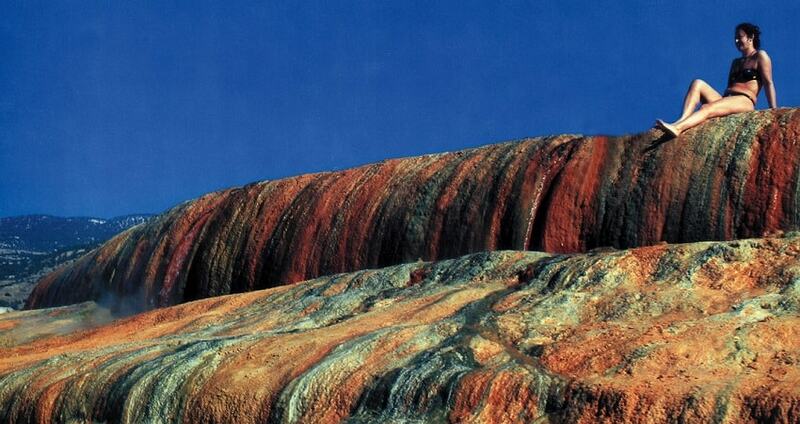 One of the famous sites of this town are the not white but red travertines. There’s a small charge to go swimming here. We also have the opportunity to explore the town which includes a beautiful mosque where you can learn more about local life and religion. For those looking to take home some original gifts and souvenirs, this is a great spot to do some shopping. The local leather shops and onyx fabrics are always a favourite with visiting guests. Following our shopping spree, it is time to make our way back to Alanya. Our comfortable air-conditioned coach is on hand to take you on the relaxing, scenery inducing journey back home. We’ll take a stop at Denizli for toilet and refreshment breaks and then it’s on to Alanya. This is a full on 2-day experience that will not only take you into stunning scenery and immerse you in our rich local history. 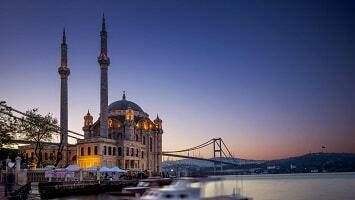 This tour will also heal your body and give you a unique Turkish natural experience that you won’t forget. If you want to enjoy history, beautiful scenery and have a genuine natural experience like no other you must join us on this 2 day adventure into the most amazing Turkish countryside locations. 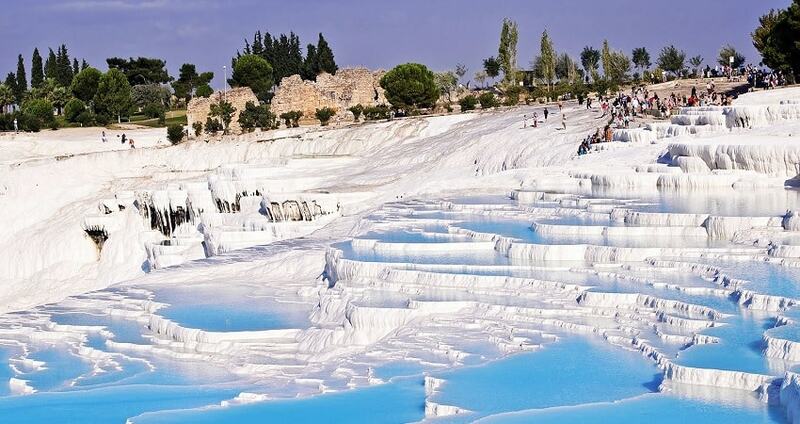 Pamukkale which translates as cotton castle is the scene for some of the oldest thermal pools in the world. 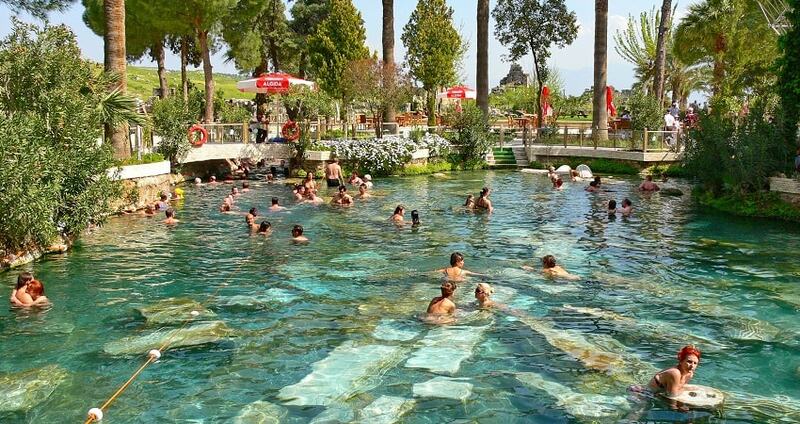 For centuries Turks and visitors have come to this stunning place to enjoy the thermal pools. The restorative, healing powers are said to aid simple coughs and sneezes and also help with arthritic conditions and more serious illnesses such as high blood pressure and heart conditions. You’ll enjoy a completely unique bathing tour as you join local Turks and reward your body in these amazing pools. With ample opportunities to explore local ruins and village life this tour offers the best of both worlds. 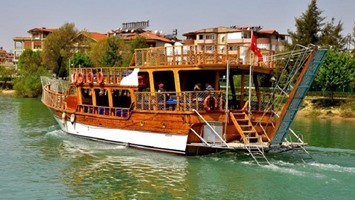 We will collect you from your hotel in Alanya and our luxury coach will transport you the 350 km journey to Pammukkale. Along the way we will make a stop for breakfast at the beautiful village of Korkuteli. Whilst this is not included in the price you are welcome to try the fares at a local restaurant or you can bring a breakfast box from your hotel. You will know straight away that this experience is going to be one for the camera. We will break up the journey and have stops along the way for your refreshment, to stretch our legs and take some photos. You will be joined on this tour by our professional and knowledgeable guides. We will visit the ancient city of Hierapolis, during which we can visit the amphitheatre, the city walls, Necropolis and ancient bathhouses. Your guide will be with you and will explain the stories and legends that make this region so famous. They will also be on hand to point out things that you may otherwise miss. Please feel free to ask your guide as many questions as you need to. We know you’ll have a lot and they are there to assist you. Your guides will also give you more information about the main attraction here, the stunning white travertines. These limestone pools are the home for the thermal springs here. The pools are formed by the hot water from the earth’s crust coming in contact with the colder fresh air. Here the carbon dioxide and monoxide are released into the air. As a result calcium carbonate forms these unique pools. From a far the lunar landscape is captivating and is even more impressive when you get up close. Following our tour of the area you have plenty of free time to explore more or to swim in the thermal pools. Join the locals and reward your body for all the hard work of the year as you relax in the warm, life inspiring waters. The view over the valley is one to behold as you lie in stunning surroundings. 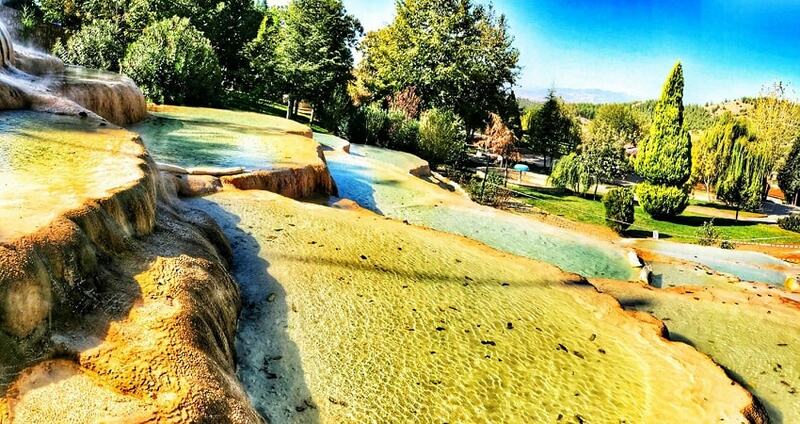 For an extra fee you can also swim and bathe in the famous Cleopatra’s pool nearby. Following our full day of exploration and relaxation it is time to check in to our comfortable hotel for the evening. Dinner will be served with the group and is fully included in the price of the package. You will not want to miss this opportunity to soar like a bird over this unique landscape. For those who wish to view Pammukkale from above there is an early start as we get up and join our professional hot air balloon crew. You will not want to miss the amazing flight as we glide peacefully over the travertines and the ancient ruins of the area. As the sun comes up you’ll be able to capture some of the most amazing scenery on your cameras to show everyone back home. This experience is an extra charge. Following a local buffet breakfast it is time to check out of the hotel and begin the rest of our adventure. This morning we will check out another thermal pool area called Red Water or Karahayit. 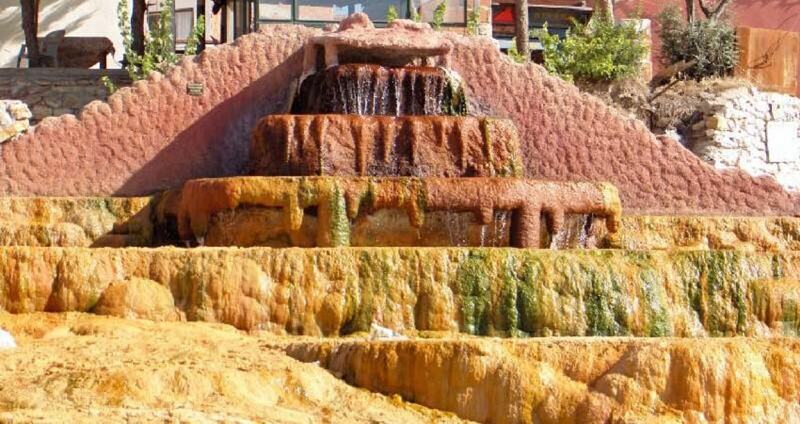 The metal oxides in the thermal waters here make the water various colours but red is the main one. It’s an interesting change from the white travertines of yesterday. We’ll enjoy our last opportunity of the trip to bathe in the thermals and enjoy their healing qualities. This site is less well known for tourists and has been a local secret for a long time. Karahayit is a perfect spot to enjoy our last thermal experience of the trip and the original colours of the travertines make fantastic photo opportunities. Following our bathing at Karahayit our comfortable air-conditioned coach will be ready to take you back to Alanya. We’ll have a few comfort stops along the way and will drop you back at your hotel when we reach Alanya.